April 09, 2019: BMW takes to the stage at Auto Shanghai 2019 with the spotlight on two model premieres in particular. The new BMW 3 Series Sedan is making its Chinese debut at the international motor show, and the latest generation of the globally popular sports sedan will be built for the Chinese market by BMW Brilliance Automotive in Shenyang. Also rolling off the assembly line here will be the long-wheelbase version of the new BMW 3 Series Sedan developed exclusively for customers in China – and likewise presented for the first time at Auto Shanghai 2019. Visitors to the show, which is taking place on 18 – 25 April 2019, will also be greeted by the world premiere of the new BMW X3 M (fuel consumption combined: 10.5 l/100 km [26.9 mpg imp]; CO2 emissions combined: 239 g/km) and new BMW X4 M (fuel consumption combined: 10.5 l/100 km [26.9 mpg imp]; CO2 emissions combined: 239 g/km), plus the Asian premiere of the new BMW 8 Series Coupe and BMW 8 Series Convertible luxury sports cars. The latest advances in the fields of electric mobility, automated driving and connectivity are showcased by the new version of the BMW X1 xDrive25Le (complete with the latest battery technology), the BMW Vision iNEXT – making its debut appearance in China – and the BMW iFE.18 race car. Auto Shanghai 2019 also heralds the arrival of the BMW Intelligent Personal Assistant in China, as the company once again demonstrates its innovative strength in the future areas of activity defined by its NUMBER ONE > NEXT strategy – D+ACES (Design, Automated Driving, Connectivity, Electrification and Services). The new products revealed at Auto Shanghai 2019 see the BMW Group underlining the importance of the host country as both a key sales market and development & production location for premium cars. The BMW Brilliance Automotive joint venture launched in 2003 operates two vehicle plants, as well as manufacturing facilities for drive systems and high-voltage batteries, in Shenyang. The recently announced round of investment and expansion will trigger a staged increase in annual production capacity from around 400,000 vehicles at present to as many as 650,000 units. Auto Shanghai takes place every other year, alternating on the calendar with Auto China in Beijing. It is one of the automotive industry's largest and most important shows worldwide. The organisers are preparing to welcome in excess of one million visitors to the 13 halls of the National Exhibition and Convention Center (NECC) in Shanghai once again this year. Over 1,000 exhibitors from around the world will present their latest models and car-related products and services over a total area spanning more than 360,000 square metres. Exclusively for the Chinese market: the long-wheelbase version of the new BMW 3 Series Sedan. BMW is unveiling its new premium midsize model that has been developed exclusively for the Chinese market. The long-wheelbase version of the new BMW 3 Series Sedan combines the new, emotionally rich design and dynamic quality of the latest-generation sports sedan with extra space in the rear compartment and specific equipment features. All of its extra wheelbase length goes towards creating class-leading space for the rear passengers. And fitting the long-wheelbase version of the new BMW 3 Series Sedan with features such as model-specific comfort seats front and rear, a panoramic glass roof and the BMW Intelligent Personal Assistant as standard also reveals a keen awareness of Chinese customers' requirements. The new model is powered by a four-cylinder engine with BMW TwinPower Turbo technology. Pace-setting sports performance: the new BMW 3 Series Sedan. The new edition of the BMW 3 Series Sedan – likewise making its China debut at Auto Shanghai 2019 – also displays a clear focus on dynamic excellence. The standard-wheelbase model will be available in China in BMW 325i guise from launch and promises to thrill and delight with sporting ability beyond any segment rival. Cutting-edge powertrain technology plays a key role here, as do the newly developed chassis, weight minimisation measures and optimised aerodynamics. As well as outperforming its predecessor in terms of driving pleasure, the new car will treat customers to exclusive equipment features, innovative driver assistance systems and an advanced display and operating system. Elite performance meets all-wheel-drive ability: the new BMW X3 M and new BMW X4 M.
The choice of Auto Shanghai 2019 as the venue for the world premiere of the new BMW X3 M and new BMW X4 M reflects the growing popularity in China of high-performance cars from BMW M GmbH. The brand's first high-performance variants in the premium midsize Sports Activity Vehicle and Sports Activity Coupe segments are the perfect way to entice new target groups over to the M way of doing things. 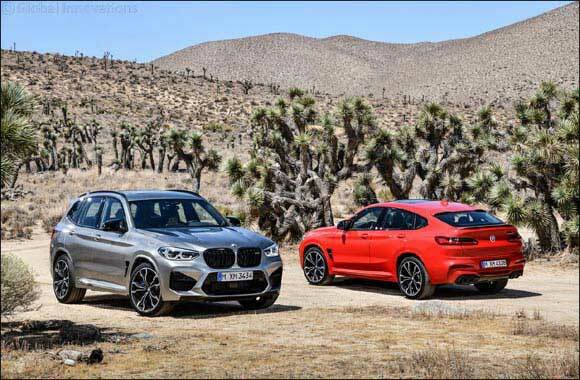 Their newly developed six-cylinder in-line engine with M TwinPower Turbo technology produces 353 kW/480 hp, while the BMW X3 M Competition (fuel consumption combined: 10.5 l/100 km [26.9 mpg imp]; CO2 emissions combined: 239 g/km) and BMW X4 M Competition (fuel consumption combined: 10.5 l/100 km [26.9 mpg imp]; CO2 emissions combined: 239 g/km) unveiled at the same time raise maximum output to a heady 375 kW/510 hp. Chassis technology tuned using racing car expertise teams up with the M xDrive all-wheel-drive system to transfer this extraordinary power to the road with poise and assurance. Luxury sports cars to capture the imagination: the new BMW 8 Series Coupe and new BMW 8 Series Convertible. With the Asian premiere of the new BMW 8 Series Coupe and new BMW 8 Series Convertible, the premium German carmaker presses ahead with its luxury-segment model offensive in China. Both models are geared squarely to delivering a driving experience majoring on agility, precision and authority. Their sporting character is complemented by a striking example of the brand's new design language, a feel of modern luxury for the interior and the latest innovations in operating tech and connectivity. Longer electric range thanks to state-of-the-art battery technology: the new BMW X1 xDrive25Le. The BMW X1 xDrive25Le developed exclusively for the Chinese market and produced in Shenyang blends versatility and luxurious spaciousness with extremely advanced powertrain technology. The compact Sports Activity Vehicle's plug-in hybrid drive system has been extensively upgraded, and advanced battery technology allows the new BMW X1 xDrive25Le to serve up an even more intense electric driving experience. The increased storage capacity of its high-voltage battery enhances both driving pleasure and efficiency. The electric range of the BMW X1 xDrive25Le is up 83 per cent to a maximum 110 kilometres, while petrol consumption in the combined cycle drops by 72 per cent. The future of driving pleasure: the BMW Vision iNEXT. The BMW Vision iNEXT, making its debut appearance in China, marks the dawn of a new era in Sheer Driving Pleasure. Highly automated, emission-free and fully connected, it integrates the BMW Group's strategic innovation fields into a Vision Vehicle. Its exterior embodies the proportions and dimensions of a modern Sports Activity Vehicle, while the interior takes the form of a mobile environment designed to enhance quality of life. The BMW Vision iNEXT represents the BMW Group's technology toolkit for the future in terms of electric mobility, automated driving and connectivity. The production car based on the Vision Vehicle will be built from 2021 and take its place in the BMW Group's model range as the company's new technology flagship. From race track to show stand: the BMW iFE.18. A matter of weeks after the sixth round of the FIA Formula E Championship season in the Chinese city of Sanya, the BMW Group will also inject a touch of progressive racing fever into Auto Shanghai 2019 with the presentation of its Formula E racing car at its show stand. The all-electric BMW iFE.18 impresses with its captivating design and innovative powertrain, which was developed using the expertise of the same engineers who came up with the drive system for the BMW i3, among other things, and are also working on the powertrains for future electrified models from BMW. The pioneering spirit, innovative power and technological expertise of BMW Motorsport and BMW i converged to create the BMW iFE.18. And that makes it a fine advert for the efficient dovetailing of racing car and production car development. Premiere in China: the BMW Intelligent Personal Assistant. The BMW Intelligent Personal Assistant ushers in a new angle on driving enjoyment. This digital character allows customers to increasingly operate the car and gain access to functions and information by straightforward voice control. The system responds to the prompt “Hey BMW” and offers an all-new means of interaction between car and driver. Customers of the new BMW 3 Series Sedan (both standard-wheelbase and long-wheelbase versions) will be the first in China to be able to use the BMW Intelligent Personal Assistant. And the digital services will be tailored closely to the needs of Chinese customers with the help of personalised and localised functions. New features here include the integration of the voice assistant Tmall Genie into the operating system of current BMW models. Automated driving: development work continues in Munich and Shanghai. The BMW Group is forging ahead with the development of technological systems for automated driving. The company is pursuing its vision of a car that people can drive themselves – but don't have to. And it has pooled its development expertise in the field of driver assistance systems and the technology required for highly- and fully-automated driving at the Autonomous Driving Campus in Unterschleißheim near Munich. Development work in China also plays a central role. The BMW Group is the first international carmaker to be granted a test licence for autonomous driving in China. The company has set up a local team of more than 60 software experts in Shanghai. And it is working with Chinese company Baidu on projects focusing on delivering safe and comfortable highly- and fully-automated driving.